It isn't typical of a business to promote conspiracy theories about its ties to the illuminati. But Denver International Airport has found a way to meld a marketing campaign with a slew of mysterious legends that have bolstered its reputation as the weirdest airport in America for over 20 years. 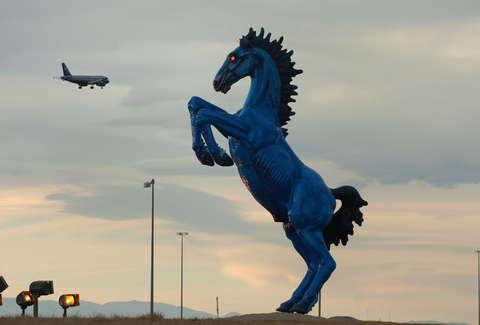 Its myriad associations with the Freemasons, its demonic, galloping horse statue, and its (alleged) subterranean walkways leading to secret meeting rooms have given the Denver International Airport a bizarre mythos. Now, though, it's a reputation the airport boldly conveys in print: New ads scattered throughout the airport's Great Hall promote a renovation project by way of aliens, gargoyles and general weirdness. The airport has done a good job injecting a dose of fun into an otherwise yawn-inducing construction project. The signs promote the DENFiles.com, which sounds like the website of a shadowy sect of conspiracy mongers, but in reality links to the airport's construction project website. The ads are predictably, strange, too: There's a gargoyle and a construction helmet emblazoned with the illuminati symbol, in addition to a very forthcoming statement about its ties to the unknown. "Since the airport’s opening in 1995, there have been endless rumors and theories. People say our underground tunnels lead to secret meeting facilities for the world’s elite. Our blue horse is thought of to be cursed. Some believe we are connected to the new world order, the Freemasons, and are home to the lizard people." You aren't likely to turn the wrong corner and be abducted by Freemasons at the Denver Airport. Just don't stare into the 32-foot horse statue's smoldering red eyes for too long; it literally killed the man who created it, after all.